Holograms occupy a strange place in our visual culture. Encountering a genuinely innovative holographic image can elicit wonder and joy, yet the technology has struggled to transcend election night gimmicks and Tupac exploitation. But for those who run the Holographic Studios in NYC, creating 3D images remains an obsession and an art. Jason Sapan, otherwise known as Dr. Laser, opened the Holographic Studios in the late 70s as both a gallery and lab devoted to the 3D images in which he saw tremendous potential. 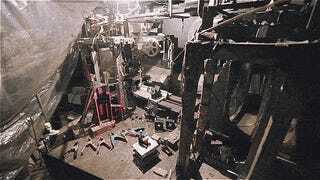 The studio produces holograms for commercial and artistic purposes deep within the rooms of a winding cellar, with apparatus literally glued together by hand, as seen in the video above. Behind the mad-scientist atmosphere is a world of technical knowledge and precision. There needs to be, in order to pull the meticulous process involving a host of lasers, mirrors, and lenses. A hologram is essentially a photographic recording of a field of light waves that are echoed off of an object with lasers. By shining this echoed light onto photographic emulsion in combination with a second laser light, an interference pattern is encoded on the film. 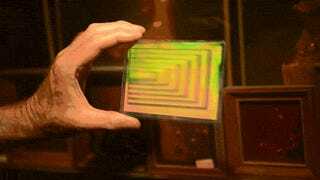 When you look at a hologram under a light source, the image you see is that interference pattern being reproduced. There's a whole lot more to it, but needless to say it involves some serious know-how. Video by Michael Hession, with additional camera by Nicholas Stango.